Josefina was a queen of Sweden and Norway. She made significant contributions to the Catholic congregations of those kingdoms. She also became known for her philanthropic efforts on behalf of women. Josefina was born in Milan in 1807. Her father, Eugène de Beauharnais, came from a humble noble family but, as Napoleon’s stepson, became appointed viceroy of Italy. In contrast, Josefina’s mother, Augusta of Bavaria, came from an ancient royal family and her marriage to de Beauharnais was typical of the many unions between old and new elites. In 1814 Austrian troops invaded Italy and the family fled, heading to maternal relatives in Bavaria. There Josefina’s father eventually became prince of Eichstätt and duke of Leuchtenberg. Josefina spent the rest of her childhood there with her five younger siblings. At the age of 15 Josefina became engaged to the Swedish crown prince Oscar (I) after having met him briefly in the summer of 1822. As a friendly gesture Josefina’s intended father-in-law, Karl XIV Johan, permitted her to retain her Catholic faith. The following year Josefina came to Sweden and quickly became popular with both the Swedish population and the court. The couple had five children in the space of six years: Karl (XV), Gustav, Oscar (II), August and the daughter Eugénie. The crown prince and his wife seemed to be living an idyllic family life at the palace, befitting the bourgeois ideals of the era. In reality the marriage was blighted by Oscar’s adultery, in particular a lengthy relationship he maintained with the actress Emilie Högqvist. He lived with her and their two sons in something akin to a normal family situation. However, the royal couple reconciled during Oscar’s reign, 1844-1859, and Josefina, according to one of her sons, came to have a serious political influence through her husband. Oscar had always strongly supported Josefina’s Catholic faith. It did not take long for her to realise that the Catholic congregation suffered from oppressive conditions in the Protestant kingdom and she spent her whole life working to improve conditions for Catholics. For example, the church of St Eugenia – the first genuine post-Reformation Catholic parish church in the North – was built in Stockholm with Josefina’s support. Further, she saw to it that many other church buildings were erected in the Swedish-Norwegian kingdom. Oscar’s recurrent pleas for freedom of religion in his royal speeches at the opening of parliament have also been put down to Josefina. During her lifetime the laws on religion were changed to allow Swedish citizens to decide for themselves which faith they wanted to follow. 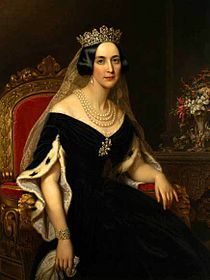 Josefina also maintained a regular correspondence with Pope Pius IX, including pleas that the Swedish congregation be provided with a more effective leadership. One of the queen’s main duties involved philanthropic activities. As befitted the idealised role of mothers at the time many of the organisations founded, led or supported by Josefina involved women and children. Her first foundation, Sällskapet för uppmuntrande av öm och sedlig modersvård (“the society for the encouragement of gentle and habitual maternity care”), is a typical example of this. The society supplied financial support to enable economically disadvantaged mothers to care for their children, while also helping the mothers to become employable. The intention of getting more women into employment also became a goal of several of the organisations that Josefina helped to establish in the early 1830s, such as Sällskapet till arbetsamhetens uppmuntran (“the society to encourage employment”) and Sällskapet för inhemsk silkesodling (“the society for domestic sericulture”). Thanks to her impressive inheritance, towards the end of her life Josefina was able to set up Josephinahemmet (the Josefina home) and Konung Oscars I’s Minne (in memory of King Oscar I). The Josefina home was a home for older poor Catholics. In memory of King Oscar I was a home for women who were somewhat more privileged but who, due to the death of their husbands or other circumstances, had lost their social or economic support. The memorial fund was open to all women irrespective of their faith and was thus a very early example of an ecumenical institution in Sweden. Both the Josefina home and King Oscar I’s Memory are still active as homes for the elderly today. Josefina died in Stockholm in 1876. She is buried in the Bernadotte family grave in Riddarholm church. Josefina, drottning , www.skbl.se/sv/artikel/Josefinadrottning, Svenskt kvinnobiografiskt lexikon (article by Avigail Rotbain), retrieved 2019-04-26.